For students of all ages, too much stress can lead to compromised academic performance, poor relationships, and, left unaddressed too long, even risk behavior, substance abuse, and chronic mental and physical health problems. While choosing online school means that certain stressors typical in traditional schools (like peer pressure, bullying, or scheduling issues) are mitigated, some sources of stress are unavoidable. In addition, if a student is new to online schooling, there may be an adjustment period that can cause more uncertainty and anxiety. Below, we offer a list of common stress factors for online students, as well as tips for helping your student cope. Lack of structure: The self-pacing and lack of scheduling structure of online school can be a big adjustment for new students, leading to additional stress while they learn how to properly schedule their day. Falling behind: While online school eliminates certain social and environmental distractions that occur in traditional schools, home can offer its own distractions. If these aren’t properly dealt with, students may fall behind and experience undue anxiety while attempting to catch up. Learning and attention issues: The ability to work at their own pace and reduce social distractions, among other things, makes online school a better option for some students who have learning and attention issues. However, even online school may not totally eliminate the stress of trying to perform well academically for a student who learns differently from others. Academic pressure: Excessive pressure from parents or peers to get good grades or gain admission to the best colleges is a frequent contributor to stress no matter what type of school environment a student chooses. Home life circumstances: Even the most loving and stable homes can’t be expected to be perfect all the time. Home life can affect school performance regardless of whether a student is learning online or in a traditional school. However, online school means students may have fewer opportunities to get away and decompress from common home life concerns. Conflict with or between parents, competition with siblings, frequent moves, and other home life events can lead to a sense of instability and stress. Set a schedule that works for your student’s individual needs: The ability to set a schedule that works for each individual student is one of the biggest advantages of online school, but it may take time to figure out an optimal structure to the day. Encourage your student to notice when they work best and when they need breaks. Allow for some trial and error to occur until they master their schedule and put it into practice consistently. Make time for breaks: With no bells ringing to let students know when it’s time for a locker break or lunch, it can be easy for over-achieving students to forget to take breaks. Remind your child that taking the right types of breaks at the right times can improve their creativity and academic performance. Have a dedicated space: Online students tend to be more successful if they have a dedicated, organized desk and workspace. A separate office or corner of the bedroom that’s quiet and out of TV-viewing range is ideal. Foster a supportive home environment: For online school to be successful, it helps if everyone in the household is on board. That might mean that parents, siblings, and other members of the household may need to adjust their schedules and habits, too. This includes being mindful of how much pressure you’re placing on a student to perform academically. Get social: Socializing is a great way to reduce stress. Making plans out of the house will give you a fresh, change of perspective too. Try your best to balance your home life, school, sleep, and socializing. Take advantage of one-on-one support: Access to counselors and social workers can reduce stress by helping kids navigate both academic and personal issues. Research shows that a good student-to-counselor ratio is 250:1, yet in most states – including Minnesota – that ratio is considerably higher. At BlueSky, our three-person support teams consist of an advisor, counselor, and social worker, keeping the student-to-support ratio well below the average and allowing for more one-on-one support time. These caring professionals know how to provide the right kind of guidance to students to help them manage stress through all manner of academic or personal concerns that may arise. 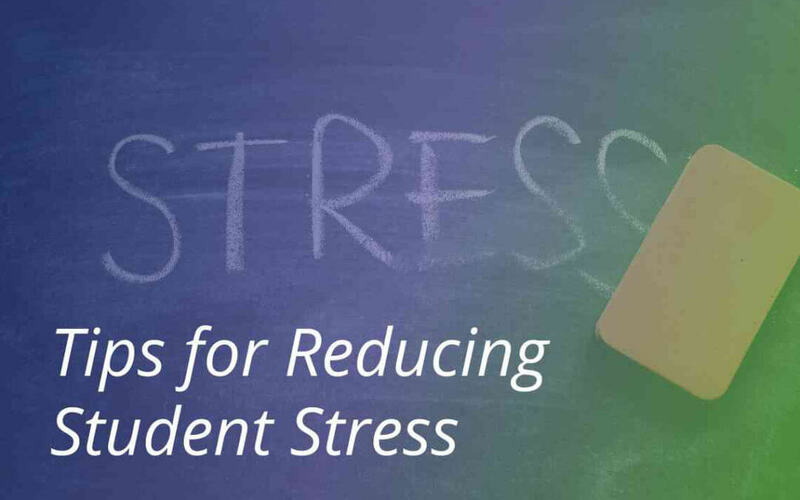 Some sources of student stress are virtually unavoidable, and others can be prevented. With the right structure, space, and support, you and your student will be able to avoid or at least mitigate the most common sources of student stress and improve your child’s chances for academic success and overall health and wellbeing. BlueSky Online School is one of Minnesota’s first online schools, serving students grades 7-12. BlueSky Online provides an individualized, dynamic education for all students. If you’d like to learn more about what BlueSky Online can offer your student, please call 651-642-088 or visit our contact us page.